We’ve driven our fair share of miles over the years. My earliest road trip memory was the journey my family made when I was 13 years old. We moved across Australia from Sydney to Perth. It’s pretty much the same as trekking across the entire US from east to west coast… except there was not much to see in the middle! And finally, our current #motherofallroadtrips across the US & Canada which started in June 2015 and will finish in June 2016. It has been on this precise road trip that I’ve discovered the most valuable, hard-earned secrets about travelling with kids. And this best secret is…? Food is a wonderful thing. It fuels our bodies, entices our tastebuds and provides an effective mechanism for ensuring children stay well behaved (most of the time). In the United States food has been easy to come by and we generally stock up at a Walmart, Target, or Publix supermarket before we hit the road. So what are the best road trip snacks to make your long voyage enjoyable? Sultanas (or raisins as they’re often called in the US), dried bananas, craisins. You name it. We love it. It’s too easy in the US to eat fast, convenient, unhealthy food. But on the other end of the spectrum they also make it easy to eat well. 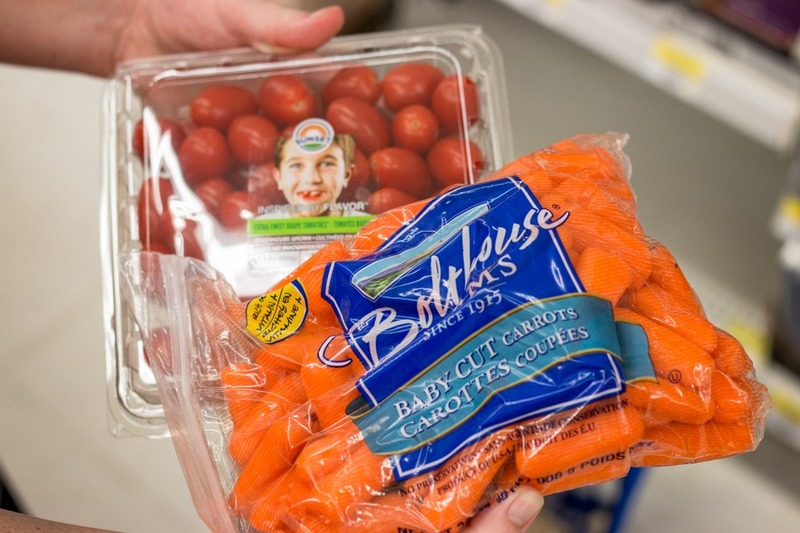 In most supermarkets you can find baby carrots in big or small bags, which means no washing, peeling or cutting. Just grab and go. My son is also a huge fan of cherry tomatoes. I love mine with a dash of chipotle ranch dressing and will often pop them in a lunch box with dipping sauce. The kids prefer sour cream mixed with French onion soup packet for a cheap-and-easy French onion dip. If you really feel like that kind of lunch box snack sounds like too much preparation, never fear. 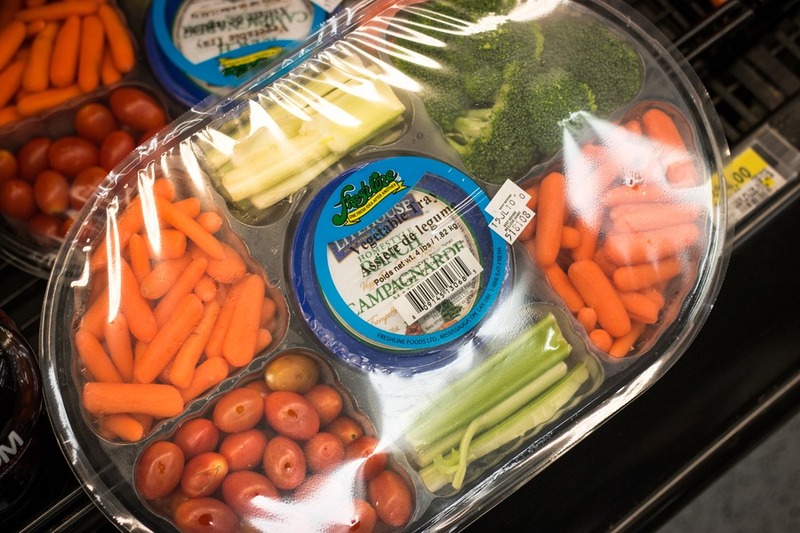 Walmart also sells all sorts of ready-to-go veggie platters. They’re one of our favourite picnic staples. Fresh fruit can be iffy because it get’s squashed, bruised and messy. However in the US (and many countries), you can find pre-prepared fruit ready to take on your road trip. Bags of sliced apples, cups of cubed watermelon, boxes of juicy pineapple. Yum! My husband has a soft spot for a tube of salt and vinegar Pringles. They don’t get squashed in the car and take up relatively less space than a big bag of air-filled chips. On the other hand I found that Quaker Crispy Minis tasted the same, but had far less calories and quickly became one of my favourite indulgent driving snacks. Goldfish snacks have almost a cult-like following and our kids got quickly hooked. You can save money and buy big bags of these snacks then transfer to smaller reusable Ziploc bags yourself, or just buy them in smaller packets ready to go. For a filling quasi breakfast or just a snack, muesli bars were a staple in my home in Australia. As such my kids have also grown up eating them. When choosing a variety check the sugar content on the package, because sometime the cheapest also contains the most sugar. Since starting my Personal Trainer Food eating program consisting of protein and vegetables, deli meat has become my new best friend (sorry Josh!). From salami sticks, to a packet of sliced ham, these road trip snacks provide that savoury flavour I yearn for without the carbs. Again on my Personal Trainer Food program I was allowed to have a small amount of hard cheese each day. Of course my kids love these as well. And cheese is always more exciting when it can be pulled off into stringy goodness. If you’re going for something a bit more sophisticated, grab a few slices of Jarlsberg or brie with crackers. Remember to bring a plastic knife for slicing. My daughter is the only one in our family that doesn’t enjoy nuts. My husband buys honey-roasted peanuts, my son will eat anything that looks like a nut (even if it’s not a nut), but prefers pistachios (he has expensive taste!). And on my eating plan I am allowed to have 1.5 ounces of almonds or pistachios each. Pistachios are my favourite too, but the shells can get messy in the car so I often go with almonds on a road trip. Pop it in the microwave before you depart or buy it already made. Popcorn is a fun snack that our kids love. Ok, so it can get a little messy, but just make sure you tell the kids they are not in a cinema and to keep the mess in the bag. Tip: We use a souvenir popcorn cup with a lid. Always carry water. It’s what everyone in our family drinks the whole time. Except me. Sometimes those long, straight, mind-numbing roads require a pit stop at the gas station for a can of Red Bull. I know, don’t tell me how bad they are, my husband reminds me each time! You can find cheap bag-style coolers almost anywhere or if you are thinking bigger then head to a dollar store for a $1 Styrofoam cooler box. Bigger yet? We carry around a Styrofoam cooler that we picked up at Walmart for just $2.22. A few bucks for re-usable ice blocks or simply fill a plastic bag with ice from the hotel and tie it up. You’re all set for your snacks that require refrigeration. Kids can get messy. Raisins and crumbs in seat creases. After a few days the back seat can look like a food Armageddon. We simply asked a friend for any type of old sheet they planned to get rid of, or you could buy a cheap one at the dollar store. We cut several holes in it for the seat belts to get through and placed it on the back seat. It’s been a lifesaver from marker pens, crumbs, spills and messy food. Once in awhile I take it out, throw it in the washing machine and put it back. The leftover food bits you’ll realise have been rescued from the bottomless crevices of the back seat will leave you stunned. Tip: While the sheet is being washed, sneak the car off for a quick wash and vacuum then place the sheet back in again. Originally we use to buy 24 packs of water bottles and carry them in the trunk. They got separated, lost, and lets face it, they’re bad for the environment. So now we all carry a refillable water bottle. Most water in the US is completely drinkable so we are not only saving money, but also helping the environment. Tips: Always keep an extra bottle topped up in the trunk in case one child decides to accidentally tip theirs out. Even if you don’t have youngsters, a packet of wet wipes can be a lifesaver on any kind of car journey involving food. Whether I’m cleaning hands or wiping up a spill, they’ve saved the day dozens of times. Just ensure they stay tightly sealed, and store them under the front passenger’s seat to keep them out of the way. Well done - you’re all prepared now! Enjoy your road trip! It’s a fun and exciting way to discover a new region and spend quality time with loved ones. And of course, tasty snacks help to make the journey even better. Wholeheartedly agree with this list. Snacks are essential for keeping kids calm on road trips. Good ones. We also like to pack some low-carb beef jerky and hard boiled eggs because they make an easy protein snack.